PONTE VEDRA BEACH, Florida (September 19, 2018) – The Olde Farm Golf Club, in Bristol, Va., designed by Bobby Weed Golf Design, hosted the American Legends for Mountain Mission Kids®, an all-star charitable golf tournament held Sept. 10, 2018, which raised $56.6 million – the new largest single-day charitable gift in PGA Tour history. The event was televised on Golf Channel. Luminaries participating in this year’s tournament included golf greats Gary Player, Jack Nicklaus, Lanny Wadkins, Betsy King, Lorena Ochoa and Lee Trevino, joined by former PGA Tour Commissioner Tim Finchem as well as by NFL icons Dan Marino and Peyton Manning, and NBA coach and player Jerry West. Arnold Palmer was memorialized in a tribute at the event, which took place on what would have been his 89th birthday. In speaking of this year’s event, Jim McGlothlin, founder of The Olde Farm, paid tribute to all who helped make it a success as well as to the exceptional ways in which Mountain Mission School serves its students. “This is the result of an exciting partnership with a group of extraordinary athletes and sponsors,” McGlothlin said. “For ninety-seven years, Mountain Mission School has provided a home, an extended family and high-quality education for children in need. The charitable donations at this year’s event greatly exceeded the previous gross record of $15 million set in 2010 at The Olde Farm’s Big 3 tournament, which featured Jack Nicklaus, Gary Player and the late Arnold Palmer, and which raised $15 million. 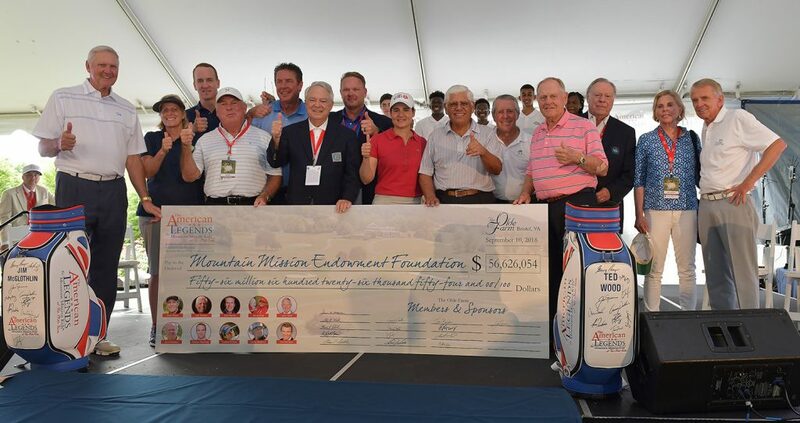 The tournament donations support the Mountain Mission School (MMS) endowment fund, which supports the MMS. The MMS, founded in 1921 in Grundy, Va., is an accredited, non-profit school which provides shelter, stability, nourishment and a high-quality education for at-risk children. Receiving no federal or state funding, for nearly a century the school has operated solely on financial gifts and donations. Since its founding, the school has served thousands of youth from the U.S. and 70 additional countries, representing diverse backgrounds. Title sponsors of this year’s event included Gregory Pharmaceutical Holdings, makers of Blue-Emu®, Food City, Johnson & Johnson, and the United Company. For more information on the event, see www.theamericanlegends.com. To donate to Mountain Mission School, see www.mmskids.org. In 1994, Weed’s career reached an apex with the formation of his own design firm, where he continues to “handcraft” golf courses. Today, Bobby Weed Golf Design has amassed an impressive list of new and renovated courses that consistently are ranked at the top of their respective categories, including The Olde Farm Golf Club, Spanish Oaks Golf Club, The Golf Course at Glen Mills, Medalist Golf Club and Timuquana Country Club. Bobby Weed is a member of the American Society of Golf Course Architects. He also is a 40-year member of the Golf Course Superintendents Association of America, was a former Certified Golf Course Superintendent and is a member of the Florida Turfgrass Association.